The long standing popularity of 4chan has been due to the entirely anonymous setup. The site's anonymous community and culture has provoked media attention, in turn inciting larger audiences. On the other side of the spectrum is Facebook—popular for its connectivity and easily identifiable names. With the brush of keyboard stroke, you can be connected with your entire high school class in a matter of seconds. 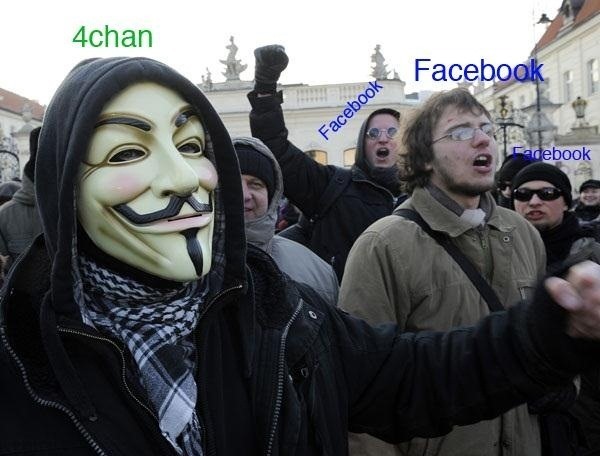 Together, Facebook and 4chan cover the two sides of the internet spectrum: public and anonymous. Together, the two don't usually mesh well. If anything, 4chan is usually the aggressor, while Facebook pays in compromised accounts. Sites that are anonymous just don't seem to fit in to the very public and forthcoming world of real name social media. 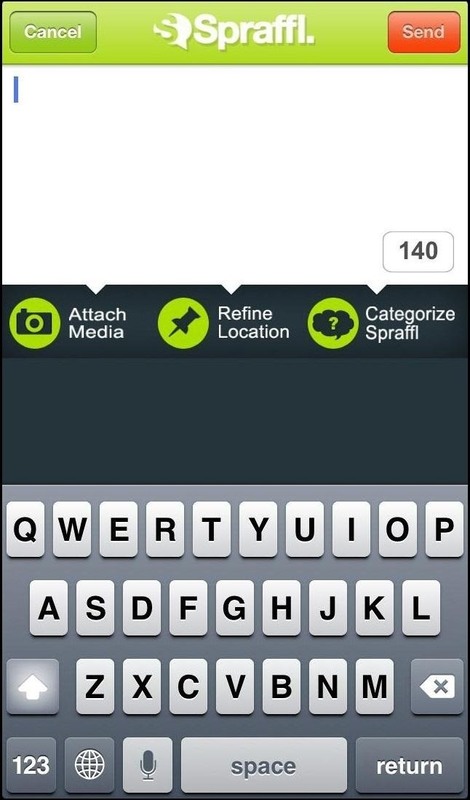 But, a new application for iOS called Spraffl is trying to change that (Android app is in development). 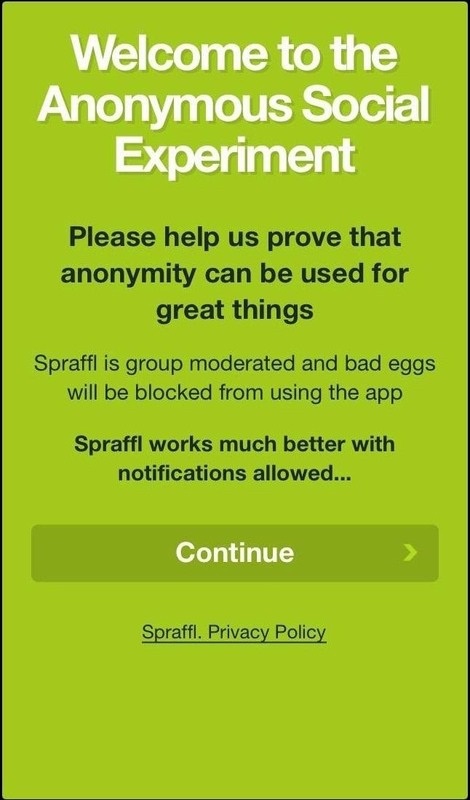 Spraffl, proclaiming to be "the world's first anonymous social network", is a unique app that takes the anonymity of a site like 4chan and combines it with the social media attributes like that of Facebook, Twitter, and Instagram. Unlike most apps, it doesn't let you sign in through any other third-party social media. All you have to do is download it, press continue, and allow the app to send you Push Notifications. 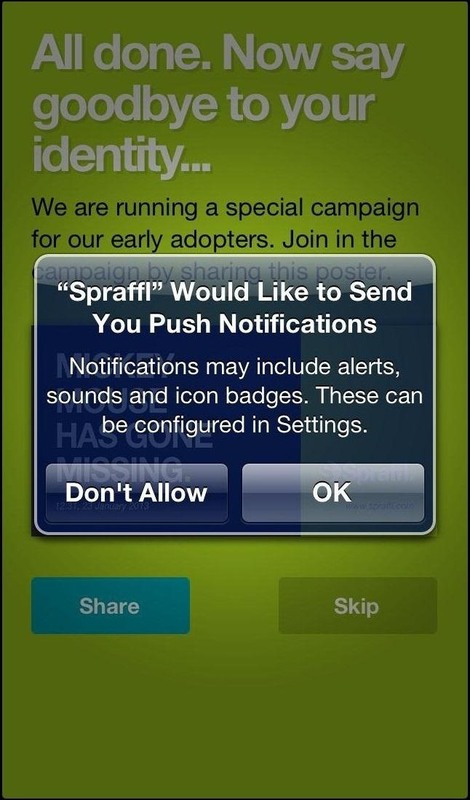 If you don't allow Spraffl to send you Push Notifications, it won't work (this was the only thing that bothered me). You'll then be sent to the main page with a search button on the top left, a list button on the top right, and a plus sign surrounded by four tabs at the bottom of the page: Live, Recruit, Activity, and Settings. All of the green circles are posts by other users, while the blue ones are your posts. 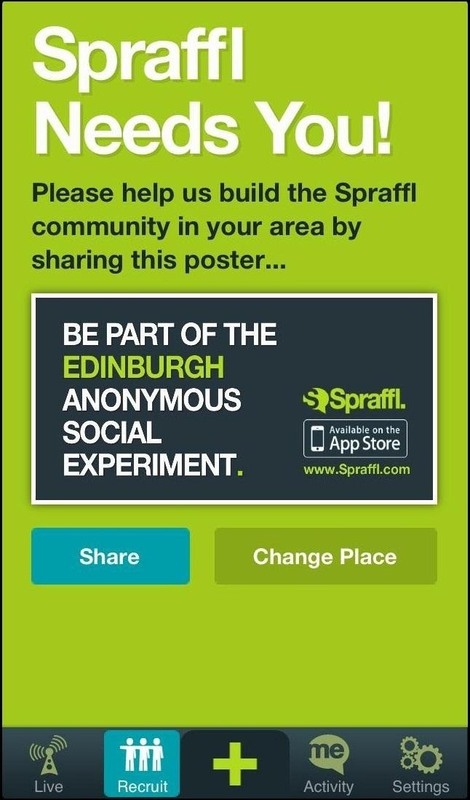 To post something on Spraffl, you'll need to tap on the large plus sign at the bottom of the page. You have 140 characters to write anything you want, with the choice of refining your location and categorizing your post. 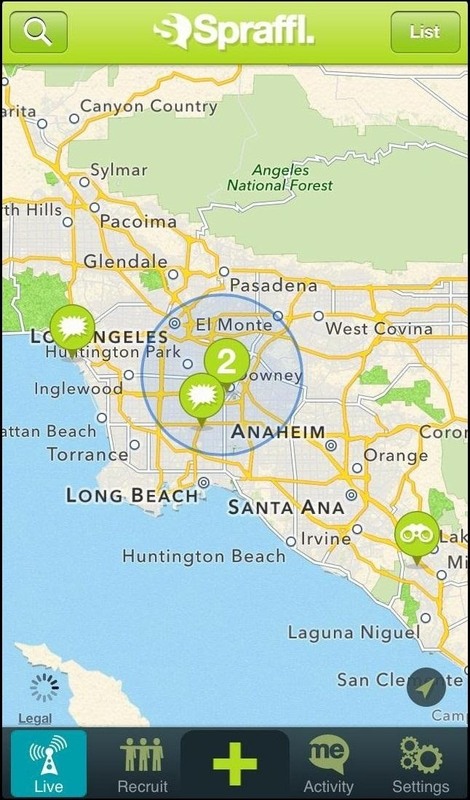 Changing the category of your Spraff (name for your post) will change the icon in the circle when viewed on the map, so that other users can see if you're asking a question, making a statement, reviewing an establishment, or just plain flirting. 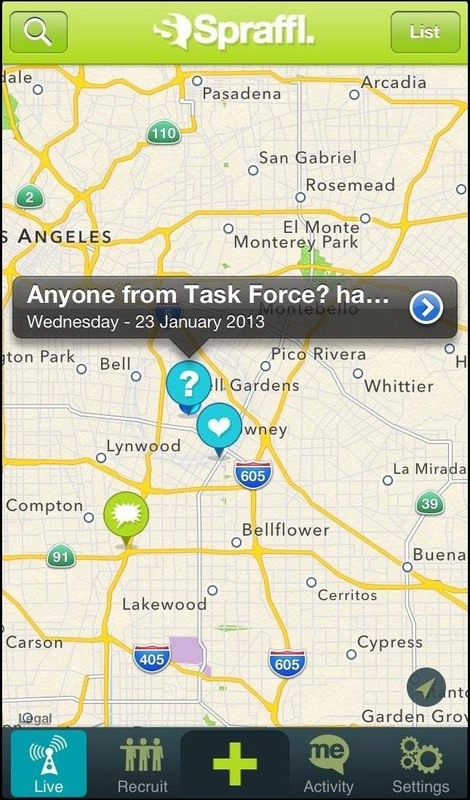 After posting, you can look around on the live map and comment on any of the posts in your vicinity. Since the application is fairly new, I couldn't find many posts. 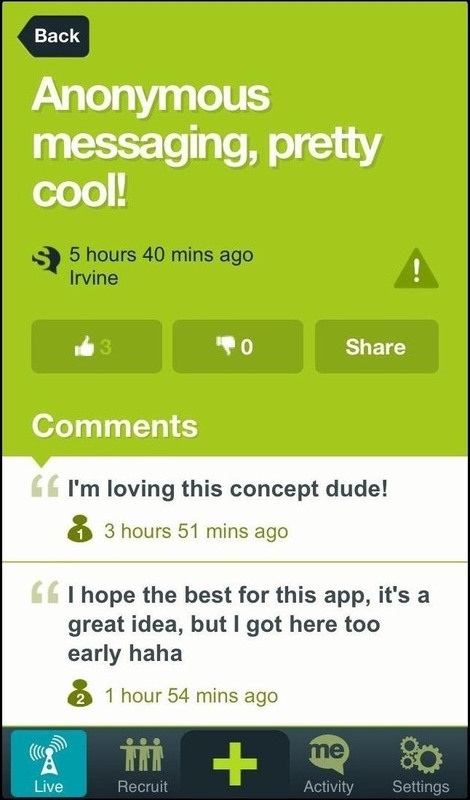 If there were posts, most of them were questions on how to use the app by new users. If someone posts on one of your posts, you will receive a Push Notification, but you can also check all of your notifications under the Activity tab. Under Settings, you can alter your Push Notifications. Since the app is very new, you can tap on the Recruit tab and share it with other friends. 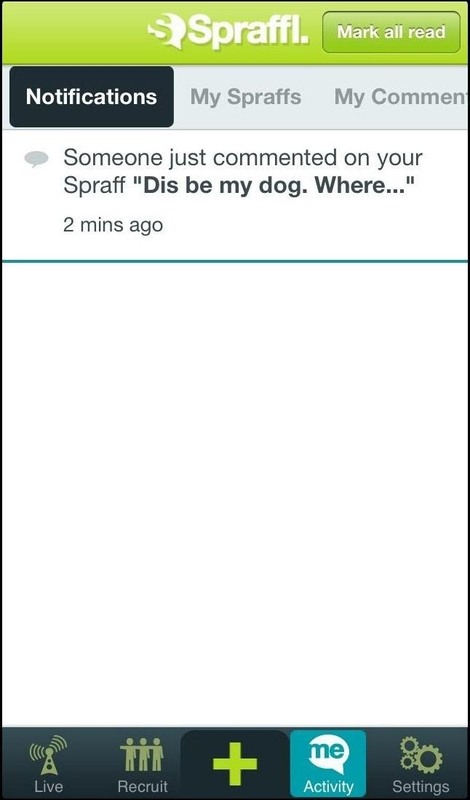 Overall, I found Spraffl to not only be entertaining, but also very useful. Spraffl is almost like a combination of several websites, which makes it all the more exciting for what lies ahead. It can be used like Craigslist, to post Spraff's when you're having garage sales, need help on housework, and looking for certain items. It can be used like Yelp to read reviews on restaurants and bars. It can be used like Twitter to read short blurbs of what people in your neighborhood are thinking. It can be used like Instagram to post pictures. It can even be used like a dating website to find love (maybe). And all while remaining completely anonymous. Looks Interesting, hoe it takes off!